Nicole Richie was looking super cute as she was snapped out in LA with a friend. Nicole wore a colorful print dress by Karen Zambos Vintage Couture, teamed with brown accessories. Reality star Kim Kardashian was faced by a crowd of paparazzi as she picked up a few items at a Rite Aid store in LA. Kim had to wear thin flip-flops on her newly pedicured feet and was spotted carrying some snake print peep toes, which despite the casual jeans are much more her style. She also carried her glam folden Fendi clutch. The latest Tag Heuer adverts starring Maria Sharapova. Tennis star Maria, who stands well over supermodel height at 6ft 2, looks amazing glammed up in the latest campaign for the company which is also represented by Uma Thurman, Brad Pitt, Tiger Woods and a number of other sports stars. The model who has been named as the new face of Versace, Isabeli Fontana, was at Barney's New York just a few days ago to celebrate the launch of Versace menswear. The Brazilian, who has also modelled for Valentino and Victoria's Secret, was beautiful in a blue dress, by Versace of course, teamed with some strappy Louboutins and some simple accessories. Gwyneth Paltrow at The Prince Trust Celebrates Success Awards in London. Gwyneth wore a black jacket over a plain little YSL grey dress, which seems to be a hit with celebs, as it's already been seen on Julianne Moore and Rihanna and was worn by Kate Moss in the latest YSL campaign. Back in LA after shooting for her new movie in London, Jessica Biel was spotted out and about in LA. The star wore William Rast jeans and a light blouse and jacket combo, with a pink scarf for just a pretty touch of color. Incase you haven't heard already, you may be interested to hear that Victoria's Secret model Alessandra Ambrosio has announced her pregnancy after weeks of speculation. "First of all, I would like to wish a happy new year to everybody and say that I have been really busy working a lot. Also, I would like to announce some really great news! My boyfriend Jamie and I were surprised in the beginning of the year with some delightful news that we are expecting our first child together! This is a dream come true and a really special moment in our lives! I'm very happy to say that our baby looks healthy and that we are really excited to be mom and dad and raising a child together. I hope this year for you all has started full of amazing surprises like it has been with me. For the time being, I ready to start to enjoy and dedicate myself to this new chapter in my life and I hope to be working soon enriched by our love for our new baby." The Kardashian sisters glam it up for OK! Magazine to promote the new season of their reality show, Keeping up with the Kardashians. Kim - Any fashion regrets? I recently wore a turquoise leopard one-piece bikini. I tend to be too trendy (laughs). Your celebrity style heroine? I love Jennifer Lopez's style. She is glamorous, but really funky at the same time. Youngest sister Khloe - Your favorite place to shop? We love going to boutique stores in New York. I love Intermix. And her style icon? - Like Kim, Khloe also loves Jennifer Lopez's style. Kourtney - Describe your own style. I love mixing things, just stuff that I have in my closet. When you put things together, I think it always looks more stylish. Paris Hilton was looking gorgeous and sunny as shopped in LA yesterday. Paris wore a summery blue and yellow dress, along with matching color sunglasses and purse. She also wore her old Marcello Toshi pumps once again. Victoria's Secret Angels Adriana Lima and Karolina Kurkova at a VS Store in LA to promote the new Biofit Uplift Bra. The new range of bras is said to give a more natural looking enhancement and lift. Click here to take a look on the Victoria's Secret website. Rachel Bilson out and about in LA. Rachel wore a baggy sweater, dark jeans and some seriously high heels. She also carried a green/yellow bag by Christian Dior. 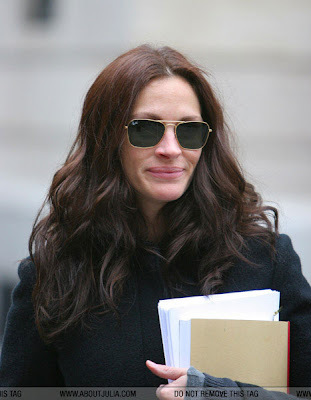 Here are a few candids of Julia Roberts out and about in New York over the last few days. Julia matched her coat with a green Hermes bag, but has also been spotted with a blue and white bag, personalized for her son Finn. Another stylish accessory she's been wearing, which is somewhat more affordable and easy to buy than a Birkin, a pair of Ray-Ban sunglasses. Amy Adams looked ultra chic in a cut-out detail Narciso Rodriguez dress at the New York premiere of her latest film, Miss Pettigrew Lives for a Day. People magazine give the world it's first peak at the cutie that is Harlow Winter Kate Madden. Proud mom and dad Nicole Richie and Joel Madden show off their one month old daughter and talk all about everything baby. Mom-to-be Jessica Alba at the Paris premiere of her latest movie release, The Eye. Jessica, who revealed at the Oscars that she's just entered her third trimester, was beautiful in a white strapless gown by Temperly London, which she wore with shimmering make-up and Bulgari jewels. Camilla Belle at another European premiere of her new movie, 10,000 B.C. This time she and her co-stars were in Madrid for the Spanish premiere. Like her Berlin premiere dress Camilla opted once again for a blue gown but this time by Carlos Miele rather than Jean Paul Gaultier.